Water Plentiful, But Contaminated in El Salvador El Salvador gets nearly six feet of rainfall each year, but clean water is in short supply. Contaminated water kills thousands there every year. But simple projects that build deep wells are beginning to succeed where expensive, modern water systems have failed. Reports from around the world on some of the most urgent emerging global health issues. The road to a small community called Milagro a Dios ends at a well, where a barefoot girl with pigtails and a pink T-shirt pumps water into a large black bucket. She says her name is Elisabeth. She's 8. Four years ago, Elisabeth nearly died. Her mother, Teresa de Jesus Aleman, says the problem was water from a shallow well. Teresa says it used to produce clean water. But things changed after a massive earthquake in 2001. "The water was ruined. All the water was ruined," she says. "The water came out of the wells, some overflowed. It was all ruined because the water was contaminated." The family couldn't afford bottled water. So they kept using the well. Teresa says lots of people got sick, including Elisabeth and another daughter. "They got very sick," she recalls. "She was diagnosed with four classes of parasites, and the other girl, too, and supposedly it's because of what we drink." El Salvador isn't a place where you'd expect to find water problems. After all, it gets nearly six feet of rainfall each year. But Ricardo Navarro says clean water is in short supply. 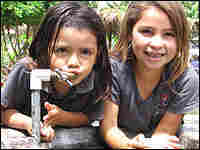 Contaminated water kills thousands of Salvadorans every year. Most are children. "When we talk about the water problem in El Salvador, we are talking about that: the lack of clean water to drink," says Navarro, president of an environmental group called the Salvadoran Center for Appropriate Technology. He says the country has failed to protect a precious resource. Farmers have cut down forests that used to store rain water. Ranchers have allowed their livestock to pollute rivers. Communities have put latrines too close to shallow wells. "Big enterprises… use the river as a place where they can throw everything. So whatever chemical goes in, it goes out," Navarro says. One solution is deep wells. They draw from aquifers so far underground they are protected from surface pollution. Groups like the U.S. Agency for International Development (USAID) and CARE International have funded a lot of these wells as part of efforts to build modern water systems. But large, ambitious projects often prove hard to sustain. For example, in the mountainous region north of San Salvador, an international coalition raised more than $500,000 to bring clean water into more than 500 homes near the town of Montepeque. A Belgian team helped design the system. Local engineers drilled a well 500 feet deep. Residents spent months digging trenches for miles of pipe. Cornelio Segura, the president of the local water board, shows what all that money has bought. He points to a thick iron pipe that carries water from a well to an underground cistern the size of a small apartment. "This is what they call the discharge tree. From there comes the water that we put in the cistern." Then, Segura opens a well hatch that covers a pump. He was there in August when they switched it on. Water flowed for a week. Then a power surge fried the pump motor at the bottom of the well. The designers hadn't allowed for the unpredictable nature of El Salvador's electrical service. Segura says it will take a big crane and $1,800 to fix the pump. "The donors gave all the material, tubing, equipment, everything, but they don't give money for maintenance," he says. Donors often misjudge a community's ability, or desire, to maintain a costly water system. So for now, residents of Montepeque are getting by on rain water and an older well. Where will people get water during the dry season? Segura offers to take a visitor there. It's a long walk that leads into the mountains and back in time. Roads become footpaths. They wind through valleys where guerrilla fighters battled government forces for more than a decade. There's a creek. Segura says it's full of cattle dung and pesticides from the sugar cane plantations. Then there's a river. "This water is good because it comes from the Huasapa hills," he says. But the river disappears in the dry season, he adds. Finally, two miles from the new well, a spring trickles from a cleft in a rocky hillside. The water is caught by a concrete basin the size of a washtub. The spring provides enough water, Segura says, "but the demand is so much that people have to wait to get water to wash their clothes, to take water for use around the house." People have been coming to this spring as long as anyone can remember. They carry away water in five-gallon jugs. "The trail is steep," Segura says. "It's dangerous for older people." He was counting on the new pump to end that problem. Overall, despite the shortcomings of many water projects, the water situation in El Salvador is getting better. Marisol Prima Ponza runs a government dispensary that tracks the health of 375 children in several communities. "There have been fewer cases of diarrhea," she says. "For example, from January to August of this year I have only recorded 17 cases." The improvement, she says, is because of better access to clean water. On the flatlands near the coast, there are several water projects that are likely to succeed long after their sponsors have moved on. These projects have strong community support and technology that's appropriate and affordable. One is a well at an elementary school. Several years ago the school asked a nonprofit group called Living Water to dig a well. Last year, the project happened. Now the children drink from a fountain of clear, safe water. "Everything we have here, everything you see, it's a miracle of God," says Lilian Cornejo, the school's administrator. At first, the well had only a hand pump. Then there was another miracle. Cornejo was giving blood, when she happened to tell a man about the school's new well. "He told me, 'Sister, I have a collection tank here that I am going to give to you so you can use it at the school.' This is a gift of God." Another gift produced an electric pump. To keep God's gifts in working order, Cornejo has included water costs in the school's budget. At a church a few blocks away, there's another new well. It has a hand pump. Pastor Eusebio Alfaro Aguilar says members of his church are trained to fix the pump if it breaks. "With God's help, it will still be here in 100 years," he says. Alfaro asks his visitors to join him in prayer. A half-dozen people link hands in the dusty yard next to the well. They offer thanks for clean water, closing with "glory to God." In Milagro a Dios, people's prayers were answered a few months ago. They got a deep well to replace the one contaminated by the 2001 earthquake. It serves 26 families. Since it's arrival, no child has gotten sick from bad water.